Loyalty has its rewards and many times good fortune comes in twos. 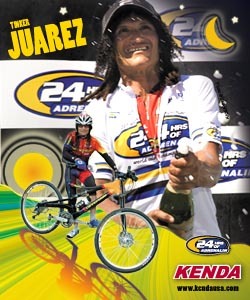 For the seventh straight year, Kenda USA is on board as a major sponsor of the 24 Hours of Adrenalin series, plus Tinker Juarez has announced his intention to defend his 2007 World Solo 24 Hours of Adrenalin Championships title. According to Jim Wannamaker, North America Marketing Director of the Bicycle Division for Kenda USA, the continued hook-up with the 24 Hours of Adrenalin series is a natural: "The 24 Hours of Adrenalin series tests not only man but machine and Kenda tires prides itself on supplying the best mountain bike tires in the world. Our commitment to the 24 Hours of Adrenalin series is as strong as ever and we look forward to providing tires and support to the racers and the event organizers. Believe me, year-after-year the 24 Hours of Adrenalin series is the one of the highlights on our year-long calendar, and for 2008 the anticipation here at Kenda USA has already begun." For Tinker Juarez, returning for the 2008 World Solo 24 Hours of Adrenalin Championships to defend his 2007 title is a given: "After 30-something years of racing, and winning lots of races, lots of national titles and going to the Olympics twice, the only thing missing from my career was a world title. So I can't even put into words how proud it made me feel to win the 2007 World Solo 24 Hours of Adrenalin Championships. There are a lot of races on my '08 schedule, but none are as important to me as winning the 2008 World Solo 24 Hours of Adrenalin Championships in Canmore. That's my number one goal for sure." This year, the World Solo 24 Hours of Adrenalin Championships return to where the Championships began 10 years ago  the Canmore Nordic Center  and will take place July 26-27. "We are very fortunate to have such great sponsors and racers," says Stuart Dorland, founder of the World Solo 24 Hours of Adrenalin Championships and the 24 Hours of Adrenalin race series. "Kenda has been such a great supporter of our events over the past seven years and Tinker is a big draw at every event he enters. His win at the 2007 World Solo 24 Hours of Adrenalin Championships was a highlight for both him personally and for the whole 24 Hours of Adrenalin Championships crew. We wish all racers continued success for 2008." While the team competition has already sold out for the 24 Hours of Adrenalin in Canmore (1,450 riders signed up in 2-1/2 days one year in advance), all divisions are still open for the remaining 24 Hours of Adrenalin series races. Plus, the World Solo 24 Hours of Adrenalin Championships is still registering qualified riders.